Dubai: Pakistan survived an onslaught by big hitter Glenn Maxwell to win the second Twenty20 international by 11 runs in a last over finish against Australia in Dubai on Friday. Maxwell hit a chancy 37-ball 52 with four boundaries and a six but could not score the 23 runs required in the final over as Australia — chasing 148 to win — ended up at 136-8 in their 20 overs at Dubai stadium. The win is skipper Sarfraz’s 10th T20 series win since taking over as captain in September 2016, including a tri-series win in Zimbabwe in July this year. That highlights Pakistan’s number one ranking in the shortest format as they powered Australia for a second match running. Australia were once again derailed at the outset with D’Arcy Short run out for two in a controversial manner with replays showing he had grounded the bat but was given out by television umpire Riaz Rashid. Skipper Aaron Finch (three) and big hitter Chris Lynn (seven) failed for a second match running as Australia were struggling at 31-3. 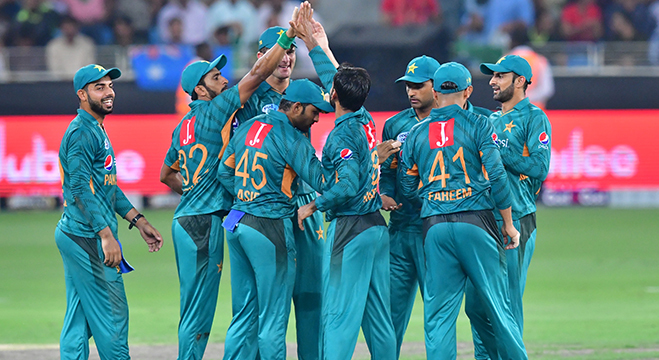 Pakistan’s total was built around a solid 70-run partnership between Azam and Hafeez who built the innings after Fakhar Zaman was out for 11 with the score at 29.